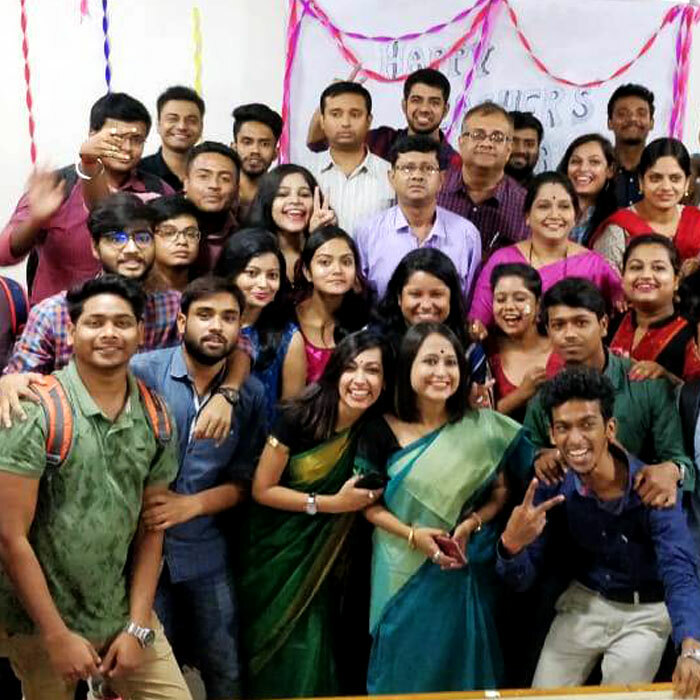 The students of NBS, comprising MBA (2017 & 2018) and PGDM (2017 & 2018) batch collectively organized a grand Teacher’s Day celebration after their regular classes. The teachers were personally invited and honored by the student team for their commitment and dedication to the cause of education. The program began with Dr. Naveen Das, Director, NBS and Dr. Krishnendu Sarkar, Director, NCMT addressing the students. Dr. Das talked about the moral and ethical values, which he expected the students to follow. Some of the faculty members shared student- teacher experiences during their times, while few addressed the students on life learning lessons and expectations that they had from their students. The program became livelier with the cultural program comprising of songs, dance and stage play performed by the students. Even the teacher’s team came up with on the spot song, dance and poetry recitation performances. Post cake cutting and snacks packet distribution, the program ended with the batch coordinators thanking all the students and wishing them to emerge as great future builders.